Impermanence is the only absolute in life. Once you get used to something, it's bound to change. And so it is with the Micro-Shack. It took a couple of months to prepare this space in 2011. Now the time has come to leave. My wife has been assigned to a new church, so we leave Floyd County and go half-way across the state to the new church in Walton county. The good news is that the new church is just a few miles from my Gwinnett County QTH -- so I'll be able to spend more time there. For now, though, I wanted to reminisce about this tiny little room where I spent many hours enjoying my hobby. It's hard to get a picture of the place -- camera angles are difficult in such a tiny room. The view above shows a clutter of equipment on the shelves, as well as other electronic debris at the periphery of the very tiny desk. To the right is the storage room door that swings outward (because there's no room to swing inward), to the left a window, and behind me, water heaters, electrical breaker boxes, and a miscellaneous pile of tools on a cheap plastic shelf unit. In other words, it's a cluttered but well-loved and well-used space. The operating desk is just 29 inches off the floor. I found this to be the perfect height. At the Gwinnett County shack, the operating desk is a 30-inch door sitting on top of a couple of filing cabinets. It's too high (about 31") and makes for uncomfortable operating. I'm seriously thinking about building support legs for the door and moving the filing cabinets elsewhere. will stay with the parsonage. That desk has seen a variety of equipment. 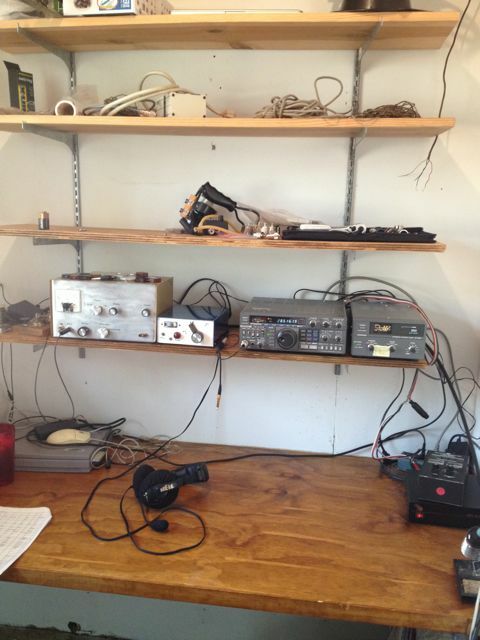 Originally, I had the Kenwood TS-430S there, as well as my "Novice" transmitter and receiver. As I spent more time there, I swapped the Kenwood for the Elecraft K2/100 in Gwinnett. 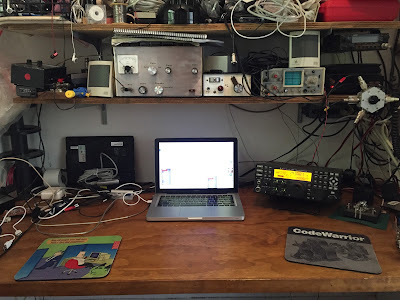 And two and a half years ago, my wife surprised me with the Elecraft K3/100, which I assembled on that very desk. I build several projects on that desk - several antenna traps, the K1EL K12 keyer, rebuilt the Mini-MOS keyer, as well as a couple of other projects I have not written up yet. The antenna setup out here in Floyd County has been extremely modest: R7000, 80/40m Trap Dipole, 160/80/40m Trap Inverted-L, and a 6m Dipole. To be honest, the R7000, despite the rebuild and the ground-mounted radial wires, has pretty much been a waste of time. This antenna never did perform well at the Gwinnett QTH, and while it is better than no antenna, it couldn't hold a candle to the wire antennas in the trees. I don't plan to put it back up, I'll probably sell it off. The 80/40m Trap Dipole, despite being at a modest height of roughly 10m has done extremely well, especially on 40m. On 80m, I did have some trouble with a weird fundamental overload of the Acer laptop keyboard -- transmitting on 80m would cause the Acer not to accept keystrokes for a short time afterwards. The 160/80/40m antenna has been the sweetest deal out here in Floyd County. With 1500 feet of radials, it's reasonably efficient, and has worked well even as a random vertical on the other bands. I made my first 6m contacts on this antenna. I haven't written about the 6m dipole antenna, because there's not much to talk about. It's just a simple dipole made with junk wire hanging in the trees at about 3m high. When 6m is open, it works! In this tiny room, I've done a ton of operating. Contests - CQWW CW (3), ARRL 10m (3), RTTY Round Up (4), NAQP CW (3), NAQP Phone (4), NAQP RTTY (3), WPX Phone (2), Georgia QSO Party (3), ARRL Field Day (2), IARU (2), CQWW RTTY (3), Sweepstakes Phone (2), ARRL 160m, Stew Perry (3), VHF Sweeps (2), ARRL DX CW (3), ARRL DX Phone, WPX CW, VHF QSO Party, CQWW Phone (2), Sweepstakes CW, ARRL 160m (2), CQ 160m CW, CQ 160m Phone. Some of them were just a few hours on a Sunday afternoon, perhaps a handful of contacts but there were several I set a new personal best score: George QSO Party, ARRL 160m, SS CW, Stew Perry. Estimating from my logs, I have made over twelve thousand QSOs from this quiet little room. A lot of that came from 10 months of very purposeful pursuit of the W1AW-portable operations in 2014, especially on the WARC bands. But most of it was operating a bunch of contests. Yes, I have a lot of fond memories of this place. Like pursuing the K1N Expedition. It was so much fun busting pileups with just a wire antennas, or getting up at 4 AM to outsmart the competition. The Micro-Shack wasn't always the most inviting place. In the wintertime, it could be quite cold. The digital thermometer would sometimes read about 45 degrees F on the coldest days. However, a small space heater would warm things up in a half-hour or so. Summertime was much tougher. When it is hot in Georgia, it is hot. I could open the door and run a floor fan to cool things down a bit -- but in the height of summer, it would just blow hot air around. I don't know how I operated contests such as Field Day or IARU in the heat of the summer. The Micro-Shack wasn't convenient, either. Feel the call of nature? Well, you have to go out of the storage room and walk to the house. More than once I was outside operating late at night and my family would lock the door. Perhaps they were trying to tell me something. I told my wife the next place should definitely have a shack where you don't have to walk out of doors to get to the operating position. Small, cluttered, inconvenient, often uncomfortable. That well describes the Micro-Shack. However, I will remember it quite fondly. It allowed me to stay connected to my hobby despite being a hundred miles away from my main QTH. Farewell, Micro-Shack. You may be gone, but you will not be forgotten. I've been fooling around with radio for more than 40 years. Finished my first receiver January 1971, so I guess it's closer to 44 years. In those early years, I didn't know anything about antennas. My initial antennas were nothing more than magnet wire strung up around my attic bedroom. They worked - Badly. Be they dipoles, center-fed Zepps, yagis, quads, Vee beams or rhombics -- horizontal antennas share one key characteristic -- their most important dimension is height above ground in wavelengths. The height determines the radiation pattern, impedance and much of the loss. I remember a few years ago on the QRP mailing lists there was a hot debate about one of W4RNL's designs -- the "88 foot" dipole. When LB modeled this antenna -- meant to be a secondary or spare antenna when your beam failed in the middle of a contest -- he did so at 100 feet and also at 70 feet. This design was supposed to give reasonable performance on 80, 40 and 20m. 88 feet worked out to be about right. Long enough not to have too crazy impedance on 80m, and short enough to not have a lot of deep nulls on 20m. At 100 feet, I bet it is a pretty good performer. At 70 feet, it wasn't a slouch, either. The odd-ball impedance would make for some loss in the feed line, but for a spare antenna, that wasn't a huge concern. From the discussions, you'd like that 88 feet was somehow a magic number that made everything work better. Heck, if you have the room make it a full-size 80m dipole then add a couple of traps, for pete's sake. And do you think those QRP stations put up that 88 feet of wire at 100 or even 70 feet? Heck no, they were down at more practical heights of 20-35 feet. 35 feet might be passible for 20m, since it is 1/2 wavelength up. But it is only 1/4 wavelength for 40m, and 1/8 wavelength for 80m. Here's the deal: the pattern of a dipole is hugely affected by the height above ground. About 1/2 wavelength, it just starts to have a bidirectional pattern, and only that at pretty high angles. Lower than 1/2 wavelength, it's basically got an ice-cream-cone shaped pattern going straight up. This pattern is rarely desirable. How high is enough? At some point above about 2 wavelengths, the dipole pattern looks a lot more like free space. For beams, at these heights, you can start to get nulls in your pattern at useful angles, so you have to be careful. Somewhere between 1/2 and 2 wavelengths is generaly the "sweet" spot for horizontal antennas. For specific applications, your best bet is to model the antenna at the desired height and watch for undesirable nulls. Given that most hams don't have supports for antennas above 50-70 feet, it's likely that any antenna below 20m is too low. Get those antennas as high as you can.